Like each year, we are glad to announce “DevNext Student Volunteers” for the year 2011. DevNext volunteers are selected on the basis of their interest and passion to serve their University and indirectly to overall students’ community by working in collaboration with DevNext User Group Leader, industry experts and other volunteers. These volunteers are expected to organize and arrange fruitful sessions for students of their respected Universities that are related to Science, Technology, Career and Project work. I am doing BS(Computer Science) from University Of Karachi & also giving services to Super Softz IT Solution as a Web Developer. I actively Participated in the All Pakistan Programming Competition”. I have interested in Oracle Database 10g , iPhone Development, Windows Phone 7 Development and Cloud Computing. Hi, I’m Kiran Fatima, student of Computer Information System Department at NED University of Engineering and Technology. I have great interest in programming and Web designing. And I want to pursue my professional career in the field of Software Engineering. I enjoy working on Programming based languages and I am working hard to be an expert. Besides it; I am good in communication and have great problems solving skills. I like to take responsibility and always persist with the task until it is achieved. I am not an expert photographer; however, I have great interest in photography. I always try to take snaps following the rules of professional photography and mostly everyone likes the snaps I take. I am very interested in mobile networking and cloud computing, which is the current trend. I am student of third year of Computer Engineering and I have done internship in summer of second year. My hobbies are surfing, hang out with friends, go out wherever possible and adjust quickly with new people and make friends. Passionate about me and others to get to know well about their field so that they could make out something innovative and competitive, want to know about the latest technology developed in the world. 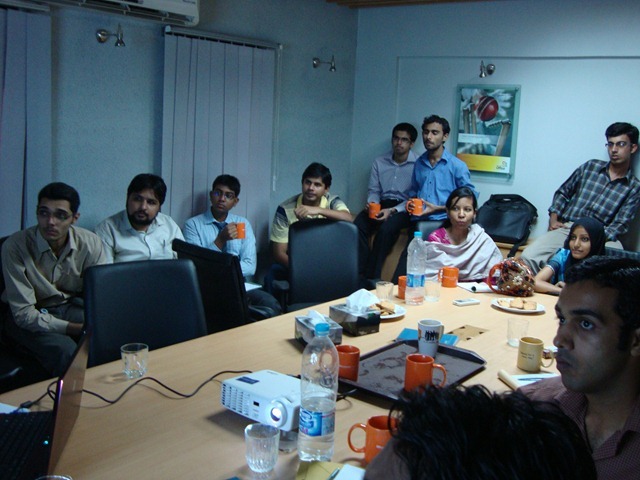 Most of the times attend each IT seminar to get well to know in which direction we are heading through. I read computer magazines like Spider, dawn newspaper, articles etc. I mostly like to know and understand the human nature. My Name is Muhammad Umair and i am studying at PAF-KIET.I am doing bachelors in Computer Science.I like to develop games on mobile and computer platform. To keep me update i mostly read blogs,online magazines specially game developer magazine. We would like to Thank all the volunteers for their interest and we expect a lot from them. As the new academic year begins, DevNext volunteers at NED University had a small meet up to discuss about the role of new volunteer force of DevNext at NED. Adil Mughal, DevNext User Group Leader, discussed with new volunteers about the User Groups, INETA, and DevNext history in NED. Adil talked about how DevNext is serving students by providing a platform for them and what they can do to serve the students community. As always, It is great having an interaction with future engineers. We hope that new volunteers will play a better role in serving their University and community. THANK YOU FOR ATTENDING VISUAL STUDIO 2010 ULTIMATE LOADFEST! 4th December 2010, we had another exciting event “Visual Studio 2010 Ultimate LoadFest”. The event was held at FAST- National University of Computer and Emerging Sciences, Karachi. We would like to thank all the organizers, speakers, participants and volunteers for making this event successful. Especially to our speakers Adil Ahmed Mughal, Jibran Jamshed and Munir Usman for their valuable time and attention to this event. The first session focused more on the new features in Visual Studio 2010 IDE. The speaker started discussion on the New Project Dialog improvements and Start Page customization in Visual Studio 2010 then moving towards Core IDE improvements that includes WPF based editor, easy code navigation, improved IntelliSense, column selection, call hierarchy etc. Adil then talked about how Visual Studio supports “Test Driven Development” and Code Focused development approach. Then ASP.NET improvements such as ASP.NET/HTML mark up snippets, Cleaner HTML, automatic HTML encoding were discussed. Finally, Visual Studio Extensibility (VSX) was discussed and some powerful/highly rated extensions such as Productivity Power Tools, Power commands etc were demonstrated to the audience. The second session was about application life cycle management with major focus on Team Foundation Server 2010. Jibran highlighted the issues faced by software development teams in the overall application life cycle and how Team Foundation Server (TFS), along with its numerous features and integration with other tools, can address those issues. He also demonstrated creating new team projects, selecting MSF process, code version control, work items and test cases execution against those work items in Visual Studio 2010 Ultimate and TFS. 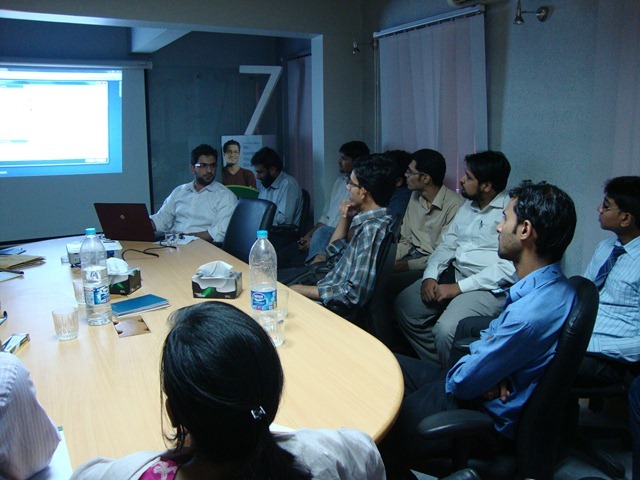 The third session was on mastering debugging in Visual Studio 2010. The speaker started discussion from basic debugging, such as usage of debugging points, stack trace, immediate window etc, to advance debugging features offered by Visual Studio such as conditional debugging, hit count, filter, macros, data tips, debug labels etc. In the end the Munir talked about the historical debugger (IntelliTrace) in VS 2010 ultimate and demonstrated how useful this feature is for developers. For more picture, please visit photo album on Emerging .NET Devs Facebook Page. If you have attended the event, please take out few minutes to fill the feedback form here. I will be speaking at Visual Studio 2010 Ultimate LoadFest. Registration is open currently and is free but seats are limited. Register yourself now!